Responsible Research and Innovation (RRI) Toolkit is available in its final version. 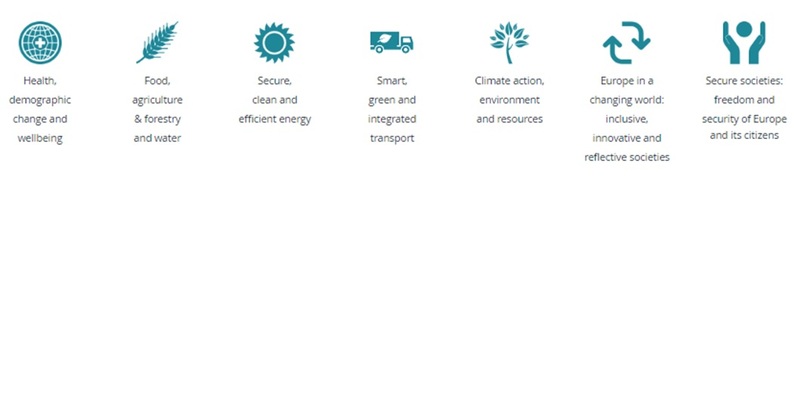 'RRI Tools' aims at building a Responsible Research & Innovation, with the concerned stakeholders and their tailored interests, to make RRI happen in real life. The European project Responsible Research & Innovation (RRI) focuses on societal actors (researchers, citizens, policy makers, business, third sector organizations, etc.) working together during the whole Research and Innovation (R&I) process. It is expected that all research players are engaged through inclusive, participatory methodologies in all stages of R&I and in all levels of R&I governance (from agenda setting, to design, implementation, and evaluation). The RRI project’s goal is to contribute to the success of activities related to Responsible research & innovation (RRI), in particular to better align both R&I processes and their outcomes with the values, needs and expectations of society (‘Science with and for Society’), - Horizon 2020. RRI actions should be promoted via the following thematic elements: public engagement, open access (OA), gender, ethics, science education), and via integrated actions fostering the uptake of the RRI approach by stakeholders and institutions. By addressing underlying research strategic issues to build effective cooperation between science and society, the project aims to make a significant contribution to debates concerning RRI formulation and implementation, to recruit new talents for science and to pair scientific excellence with social awareness and responsibility. In October 2016, the RRI project released RRI Toolkit (in its final version), which is an open online platform that helps research and innovation actors across Europe work in a more social, sustainable and ethical way. To help visitors find what they need, the website includes several levels of navigation, first to understand what RRI is and then to browse through the Toolkit, depending of the experience and needs of users. Cross-border interests: Open Access (OA) – Ethics – Governance – Public engagement – Science Education – Gender Equality. Each of the aforementioned sections provides free access to recommended resources, including tools, inspiring practices, projects and online library elements. For example, the OA section provides useful information on how to put OA into practice, in particular on: How to implement OA policies at institutions – How to incorporate OA in research practice – How to move from OA to Open Science – Training. Moreover, the OA section offers access to the following resources/tools (providing detailed information on how to implement OA strategies and policies): How_Open_is is? – RoMEO-publishers’ copyright & self-archiving policies – Directory_of OA Journals – Open Data – Open Data Barometer – Open Science Framework –Registry of OA Repository Mandates and Policies. Among Inspiring Practices for OA there are: Marlisco : Marine Litter in European Seas – KlimaAlltag – low carbon lifestyles – Mistra Urban Futures – EuroBioAct and others. In RRI Library - connected with the OA section - you can browse, access and download documents, videos, presentations, blogs and other types of resources on OA. can be found in RRI Tools Forum and in RRI blog (comprised in Communication resources section). The final version of the RRi Toolkit contains also a revamped Self-Reflection Tool, which goal is to stimulate reflection and offer inspiring ideas for your research and innovation practices. If you are interested in applying RRI concepts and strategies in particular contexts (according to specific profile) and within specific areas (according to specific interests), take a look at RRI 28 How-Hos section and at additional Training resources. English, Bulgarian, Catalan, Czech, Dutch, Estonian, French, German, Greek, Hungarian, Italian, Latvian, Lithuanian, Portuguese, Romanian, Serbo-Croatian, Spanish, and Swedish. 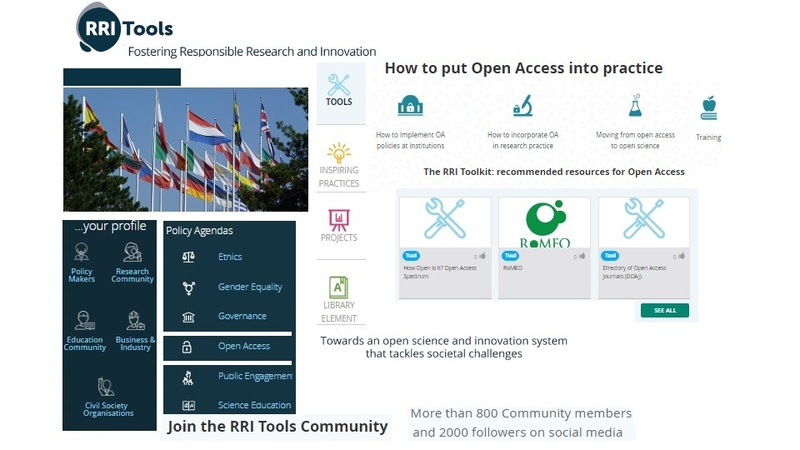 By joining the RRI Tools Community, you will be able to: create your own profile – find relevant contents – do networking – upload new resources – rate existing resources – promote your projects – have your say and much more! You can also help to spread a word about the RRI Tool on Thunderclap campaign platform: one single message will be sent through your social media. Currently, the RRI Tools team is preparing for the project's Conference and Ceremony of the EFARRI Awards for Responsible Research and Innovation, which will take place in Brussels on November 21st-22nd, 2016. This event will be the occasion to discuss the implementation and evolution of RRI in the future. Horizon 2020 continues to promote ‘cross-cutting issues’ regarding ‘Science with and for Society’; in many cases, inter- and trans-disciplinary solutions will have to be developed, which cut across the multiple specific objectives of Horizon 2020 and which will further promote RRI uptake.